Here are all the news from the 2nd half of 2005 - some of these may be outdated already, so please check out the newest news for updates! Sorry for the lenghty quiet season from me. Some words of excuse: I've been very busy at home with the babies, as well as at work. I've had to do some travelling for work as well as some lenghty days, so I've had little time to update my pages recently. This update is missing a lot of stuff that I wanted to include, but I didn't want to delay the update any more than what I already had to. That "stuff" (mainly discography additions, as well as some pictures and old tour dates related things) will go to the next update after this one. Dio is going to release a new DVD on October 3rd in Europe, the Japanese release date will be October 26th. This probably will not be released in the US for now at least. The DVD is being released by Universal. Front cover of the DVD can be seen by clicking here! In addition to the We Rock DVD, us Europeans will get a remastered release of the Holy Diver album on October 3rd too! Some sources claim that the CD would be released on September 30th, but apparently it will be October 3rd. The record company is a recently founded Rock Candy Records, who release this together with Universal Music. The people behind Rock Candy - Dante Banutto and Derek Oliver are from the British Kerrang! magazine. The CD will have extensive sleeve notes, expanded artwwork and a new audio interview with Ronnie. Some sources claim that there would be a bonus track on the CD but that is just confusion with the interview. Evil Or Divine, which has been previously available on both DVD and CD, will be re-released by Spitfire Records (Dio's ex record company) at least in the US as a "double release". The package will contain both the DVD and the CD releases, as well as some bonus material, such as video for the song "Push", Ronnie's interview, behind the scenes footage and a photo gallery - probably taken from the "Killing The Dragon Special Edition" CD. This package will hit the stores on October 4rd. Dio's currently on the road in Russia and based on the reports, the tour is going extremely well! As far as I know, the shows have been sold out everywhere! Dio will have a couple of dates in the Eastern and Central Europe after the Russian shows, after which they continue to UK, Ireland and Israel. After a short break then the band will continue their tour to Scandinavia, where they'll play from December 1st to 10th, before travelling to Germany for another tour there from December 13th to 21st. Scandinavian dates can already be found on the Master Of The Moon tour date page while the German dates are not finalized yet. So, Dio will not have the chance to do South American or US tours this year. However, they are planning to do South American tour in April 2006 and then in the Summer, do a full-blown US tour. As previously announced, Ronnie sings one song on the forthcoming Eddie Ojeda (Twisted Sister guitarist) solo CD titled "Axes 2 Axes". The release date has now been set to October 24th on the Greek record label Black Lotus Records. The US release will be in January 2006 if all goes as planned. The front sleeve picture has also been revealed - click here to see it! Vinny and Jimmy are also working for a new CD release, which should be available some time next year. This is not with Hollywood Allstarz but with their new band "Three Legged Dog". Tracy G's new CD out! Ex Dio guitarist Tracy G released his CD earlier on this month. The CD is titled "Erector Pili" and is available through Tracy's web site at http://www.tracyg.com/! Dio's bassist Rudy has been working on a book from his Ozzy Osbourne years, titled as "Off The Rails - My Adventures In The Land Of Ozz". It was meant to be released on September 15th, but has been delayed with no new release date set yet. I've started to hear again an increasing number of "Rainbow Reunion" rumors - I guess it is again that time of the year when the rumors start to surface. The answer is still the same as always - "No, Rainbow Is Not Reforming". Ritchie has just announced the title for his next Blackmore's Night album, "Village Lanterne" and it should be out in early 2006 on SPV Records. There is already a single out for the album, titled "I'll Be There (Just Call My Name)". Blackmore's Night is also releasing a DVD in USA and Canada on October 11th. It is titled "Castles And Dreams" and includes over 4½ hours of live material, TV appearances, music videos and so forth. The main theme on it is a full concert from Burg Veldenstein in Neuhaus, Germany. Blackmore's Night will play three concerts in the US this year, December 8th at The Concert Hall in New York, NY, Dec 9th at The Strand Theater in Lakewood, NJ and Dec 10th at the Scottish Rite Theater in Collingswood, NJ. Dio on Swedish Radio including web broadcast! Dio's gig from the summer's Sweden Rock Festival is going to be broadcasted on Swedish Radio called P4! The gig will be broadcasted on October 29th at 8pm or 9pm CET (GMT+1). Check out the web site at address http://www.sr.se/cgi-bin/p4/programsidor/index.asp?ProgramID=488. The pages are in Swedish but are pretty easy to navigate for non-Swedish speaking people too. This coming fall will see Dio doing a very special Russian and UK tour: The band will be both the warming-up act and the main band. They'll do first the Holy Diver album from start to finish, then take a short break and continue with a regular set. The band is going to have a film crew at one of the Russian shows in September and the Holy Diver gig will be filmed for a future DVD release. It has not yet been decided which show will have the honor to be filmed, except that it is going to happen during the Russian tour. The release date has not been set yet for this DVD. It remains also still unknown whether they'll film also the regular gig following the Holy Diver part. Last May brought news about Ronnie's future appearance on the silver screen. The duo Tenacious D, Jack Black and Kyle Gass (who also appeared on Dio's video "Push" off Killing The Dragon album) asked Ronnie to play himself in their forthcoming "Tenacious D: The Pick Of Destiny" movie. Ronnie's part was filmed on July 15th, right after Dio's European tour this summer was over. Ronnie will play himself in the movie, as well as sing part of a song too - the song was written by Jack and Kyle. Other members of the cast include of course Jack Black and Kyle Gass, as well as JR "Lee" Reed, Tim Robbins, Ben Stiller, Meatloaf and Will Ferrell. The movie has been scheduled for June 6th, 2006 release. It is directed by Liam Lynch, who has been involved in other Tenacious D projects too. The film is produced by Ben Stiller's Red Hour Films and Working Title Films, who produced also a record collector classic "High Fidelity". 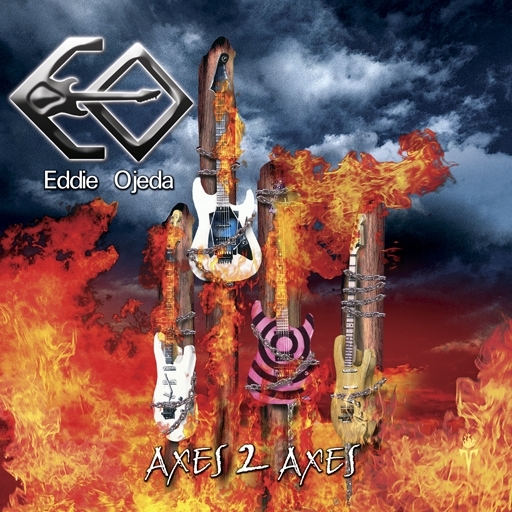 Twisted Sister's guitarist Eddie Ojeda is still working on his solo album, called Axes 2 Axes. The album will be released by Black Lotus Records and features some big names of the heavy rock world - Dee Snider, Joe Lynn Turner, Chris McCarvill, Joe Franco and Dio's Rudy Sarzo and Ronnie himself! Ronnie will sing one song on the album. Rudy is going to play bass on two tracks. The release date has not been set yet, but Eddie Ojeda plans to have it out as soon as possible. Many small changes to the Russian tour this fall, as well as new gigs listed too! Many venues were upgraded to larger halls. The tour will stop also in Poland, Holland and Belgium in the Central Europe as the band proceeds towards the UK. This is actually not a piece of news, just an article I wrote about the Black And Blue DVD release projects. As the long-time readers of my pages probably know already, there has been a couple of tries to get the Black And Blue DVD relased officially, but not with much luck. Read the story by clicking here! Tracy G, ex Dio guitarist, will appear on a forthcoming David Lee Roth tribute CD, where he will join drummer Patrick Johansson (of Yngwie Malmsteen's band) and vocalist Chris Heaven for one song. The release date for the CD has not been published yet. In addition to Tracy G, other musicians on the album include also ex Dio guitarist Rowan Robertson and ex drummer Vinny Appice! This sounds like another Dioful tribute album! Bob Daisley, bassist from Rainbow's Long Live Rock 'N' Roll album and tour as well as from one Dio Scandinavian tour in the late 1990s, is going to appear on forthcoming Gary Moore album. He's also touring around Europe with his band "Hoochie Koochie Men" and is recording with his old band Kahvas Jute in Sydney. Kahvas Jute is going to release a "Triple Pack", which constists of a live DVD, remastered album "Wide Open" from 1971 with bonus tracks and a live album from a small show on July 17th, 2005. In addition to that, Bob is also involved with a band called Living Loud. It consists of Bob Daisley on bass, Jimmy Barnes on vocals, Deep Purple's guitarist Steve Morse and keyboardist Don Airey as well as Uriah Heep's Lee Kerslake on drums. They are going to do an European tour in September 2005 and another tour both in Europe and US in early 2006. Doug Aldrich, Dio's guitarist for the Killing The Dragon album and tour (after which he joined Whitesnake) announced that the Whitesnake live DVD has been postponed. The reason for the postponing was that their producer had a heart attack and was obviously not able to finish the DVD. The DVD was filmed during Whitesnake's world tour a while ago and is titled as "The Rock & Roll, Rhythm & Blues Show" at least for now. Vivian Campbell will release his first solo album on September 6th world-wide. The album is strangely titled "Two Sides Of If". It is not going to be heavy metal, it is not going to be rock, but it is going to be a blues record. The band consists of Viv Campbell on both guitar and vocals, Billy Gibbons and Joan Osbourne making guest appearances and Terry Bozzio on drums. Samples and details about Viv's album can be found on his own web site at address http://www.viviancampbell.com/. Ronnie's birthday is in three days' time, on July 10th! I'd like to use this opportunity to give my birthday greetings to the man and to the voice of the heavy metal, enjoy your day! The European festival tour is just about done, just Rockwave Festival in Greece left before the band flies back to home for a short rest. The tour preparations and rehearsals for the Russian and UK tours will start pretty soon though, so there is no real summer vacation for the band this year - who didn't get summer vacation last year either! Dio's gig at Waldrock Festival in Holland (June 4th) was recorded by Dutch radio station and it will be broadcasted on July 22nd, 2005! There will be regular "on-the-air" broadcast as well as stream on the Internet. Check out the radio station at this address: http://www.waldrock.nl/radio.htm! Dio will travel to Israel for a gig for the first time ever! They'll play at Hangar 11 in Tel Aviv, Israel on October 29th, after their UK and Ireland tour is done. And by the way, there has been some rumors about the Holy Diver lineup reunion for the UK's "Night With Dio" tour Holy Diver section but that is not going to happen. Ronnie is very happy with the current Dio lineup and there are no plans to bring back the old lineup for this. The current plans have Scandinavian and German tours in horizon for the late November and December. No dates have been set yet, so please don't e-mail me and ask those - I will put them up on my pages as soon as I get them, provided of course that the tour happens. The follow-up album for Master Of The Moon will see the light next year. Writing will probably start early next year after the tours are done - according to Ronnie, he never writes material for albums on tour as he needs to concentrate on the writing so heavily that it is not possible to tour at the same time. There are plans to do Magica II + III album - but on the other hand, some sources speak about "regular" album instead. Next year will tell which one it is going to be. Chuck Garric (touring bassist for Dio on a couple of European tours) joined Eric Singer & Friends and toured Europe and Australia at least with them. The Australian tour was with Alice Cooper - who also had Chuck in his band! Rowan Robertson and Finnish Marko Pukkila team up! Rowan Robertson, guitarist from the Lock Up The Wolves album, recently announced teaming up with Finnish bassist and composer Marko Pukkila, former Altaria. Their new band is called Wicked Outlaw and they're looking for a singer and drummer to complete the line-up. Interested? Contact them at address info@markopukkila.com! Rowan and Marko are writing material together at the moment, with plans to hit the road in the US and Europe next year. By the way, I see interesting trend here. First Jens Johansson, keyboardist on Lock Up The Wolves, joined the Finnish band Stratovarius some ten years ago. Now Rowan, from the same Dio line up, joins another Finnish band. Lets see when the rest of the Lock Up The Wolves band members (Ronnie, Simon and Teddy Cook) start to follow the trend ;) I'd like to wish them welcome to here in Finland for sure! Tracy has finished recording his newest CD and it is being mastered by a long-time Dio fan Scot Clayton. Tony Iommi from Black Sabbath released his solo CD "Fused" on Sanctuary Records on July 12th. The band includes vocalist/bassist Glenn Hughes and drummer Kenny Aronoff. Tony will also hit the road with this line-up after this year's compulsory Black Sabbath reunion Ozzfest tour is done. Sounds unbelievable, but it looks like Vinny will appear on one track on New Yorkian rapper "Necro" new album. The track is going to be called Circle Of Tyrants. Also Sepultura's drummer Igor Cavalera should take part of the CD. Some might be interested in recent Dio auctions and other sales. There has been two copies of the very first Ronnie And The Red Caps single for auction on Ebay. One of them went up to $431, second one to $272 - apparently it was not in the same condition as the first one. Also two copies of Dio's The Great Box Japanese 4CD box set have been sold recently, one for $100 and another for $260. This is certainly the rarest Dio CD release ever - if you don't count the promo copy of it!